In my first 3¼ years I knew my grandmother’s love, and I know it has nourished & informed me through all my 78+ years so far. I have no sure memory of her, & for decades I hardly ever thought of her, until once on an ecstasy (already two decades ago) I felt I knew her love and how it sustains me. Later I looked again in the memoirs my mother wrote for me, read again how she loved me, and relearned more things about her. This portrait is the only photograph that I have of her. Sometimes when I crinkle my eyes and look at it I see her smiling happily, a smile I feel I know. Sometimes I also see my mother, myself, something in each of my three sons. 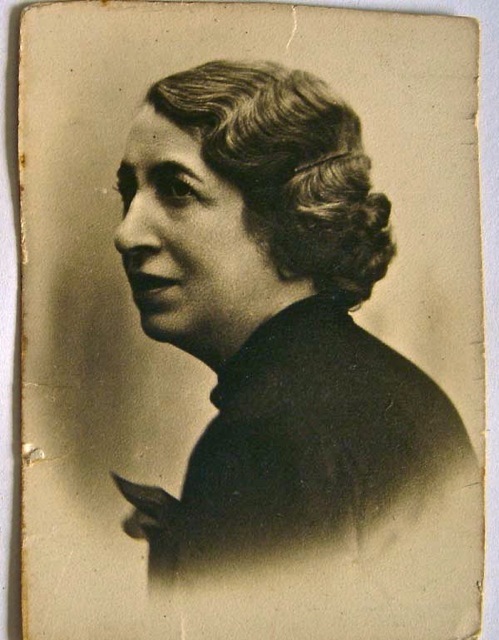 Ernestyna Akst, who would become my mother’s mother, my maternal grandmother, was born in 1885 in Warsaw, and lived there until she was taken to a German concentration camp (I don’t know which, I don’t know when) and exterminated. I don’t know when this photo, which is also my only photo of any ancestor before my parents, was taken. It may be from those 3¼ years. She was the only grandparent I was close to. My father’s parents were older, and more distant. They too were exterminated by the Nazis, I don’t know how, or, where, or when. In June 1936, when I was born, my grandmother lived alone in a small apartment. She had been an independent widow since her husband, Leopold Hermelin, died in 1920 – and an independent woman for about a decade before that, managing to continue paying rent and providing for my uncle Bronek and my mother, Henia, by making children’s clothes at home for private clients, after the grandfather I never knew lost the family business & home & all their movable possessions playing cards, and became a broken man. 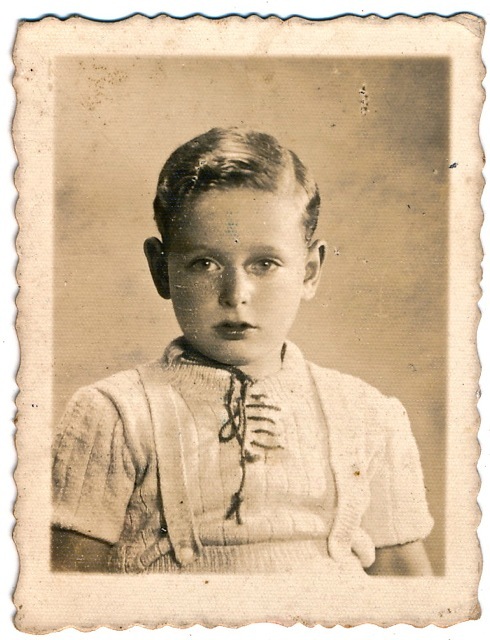 The last time we saw each other was when my parents took me to the car after saying goodbye to her as we fled from Warsaw, September 1, 1939, the day the bombs started falling. The only memory I have of her may have been from that occasion, or perhaps is only a later dream: My parents and I are standing in a dim hallway – of her apartment? of ours? – facing her, and though what I see only her face & figure is somewhat blurred I know she is worried and anxious, and she tells that the framed mirror in the hall broke (because of a bombing? ), and shows us the cracks, and says it’s a bad omen. I can’t imagine what she felt as we were parting. Did she want to come with us? I don’t know why she didn’t come instead of the Polish ‘girl who took care of’ me, who accompanied us for many months, until she was let go in Vilna (I have no memories of her either) : because she didn’t want to leave Warsaw then? Because my mother’s elder (two years older) brother, my uncle Bronek, was not leaving? Or, what I always hate to think, because of the bad relations between my father and her, because she didn’t want to be a cause of possible friction? or because he didn’t want to take her with us? I do know that this was not the first harsh trauma of this wonderful woman’s life, and I feel her as wonderful also because how she came out of the one that totally overturned the comfortable, fashionable, well-to-do high life she had grown up in and had continued to live as a married woman on the income brought in from the successful business her husband had established with the handsome dowry she had brought him. This whole life began collapsing soon after my mother was five, when the husband lost everything playing cards. What she did from then on, this woman who had learned no specific money-earning skills because in her family’s circles a young woman was not expected to need or have any such skills – how she managed to continue good-spiritedly, in hard times and years of war and years of harsh economic depressions, to shelter and nourish her family and nurture her two young children through adolescence and into adulthood, and later to give her apartment to my mother and father so that they could marry and have a home to live in, and further bore the pain of my father’s inexplicable indignation against her (because her son, my uncle Bronek, reneged on the promissory notes he’d signed for the furniture he gave my parents for his wedding gift) and continued to give her love to me – all this, I feel, was truly wonderful. For Henia and Bronek, who later became my mother and my uncle, it was also a harsh shock, that trauma of the overturning of their lives, to be taken from their previous spacious and fashionable surroundings, best clothes and toys, servants, personal carers for each of them (for their mother was often busy entertaining cultural and literary people in what may have even been a ‘salon’). From that swathing comfort they were thrust into far poorer living conditions, and not for a short time. And I’m so glad that it has not repeated in my family in my sons’ generation. And am glad that we live in different times (also a subject for another time). And even more glad that my grandchildren can know their grandmother’s love, because I feel there are things loving grandmothers can give and qualities they can empower or inspire that loving parents can’t. I know much more about what a grandmother’s love can be since I too became a grandparent, not only a proud and doting grandfather of now four wonderful (each in his or her own way – and I’m not being sexist, the boys were born first in each pair) grandchildren, but also the lucky partner of a devoted loving grandmother, who has always been there for them in many ways I find wonderful, and I’m glad and proud to have been able, so far, to help her be there. And what also fills me with wonder is that she can do all this without having ever known a grandmother’s love, for her parents had come to Palestine in the 1930s to help build a Jewish homeland, and had left their parents in Polish Ukraine, where they too were later exterminated. I have no clear memory of my grandmother’s presence, perhaps because I was only 3¼ when we parted, and one doesn’t remember what one left behind at that age, or because I learned early to repress memories that might make me grieve. Yet a later understanding of myself has made me feel, with a warmth and a certitude, that in those short years I was a most fortunate recipient of her love and care and that I imbibed from her so much of that in me that I can think of as my goodness or my positiveness of spirit – which I’ll be the first to admit isn’t there all the time, but, thank goodness, is still there now to help me get back from other moods. But I do have memories of her absence, of times when letters from her still arrived, probably in Vilna, perhaps also in Shanghai, on thin paper with much of what she wrote blacked out in thick and straight black lines by the censor of the German “General Government”, and the feelings of much anguish and little hope that accompanied them. I’ve often thought of my grandmother remembering me with love in her last years, I’ve even imagined her carrying her love and mine (for sometimes, I’m sure of it, for I sometimes still feel it directly from my grandchildren, she must have felt me giving my love to her) in her heart and mind while she was being herded to her death. I want to write at least another “page” on what I know about my grandmother and her life and background. 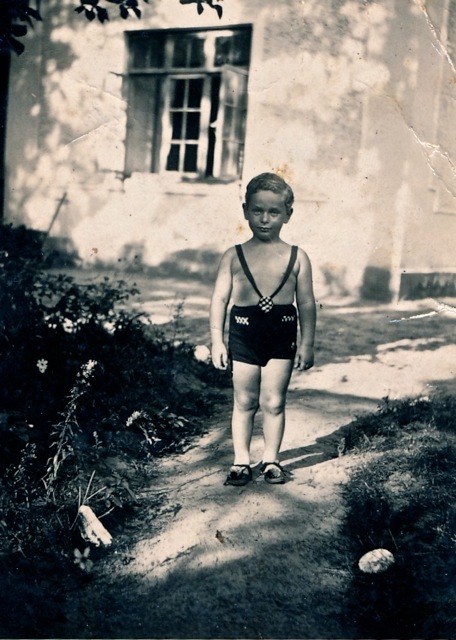 I’ll conclude this first one with a link to the part of my mother’s memoirs that begins the story of the time from when my birth became a possibility until we left my grandmother in Warsaw: Motherhood. 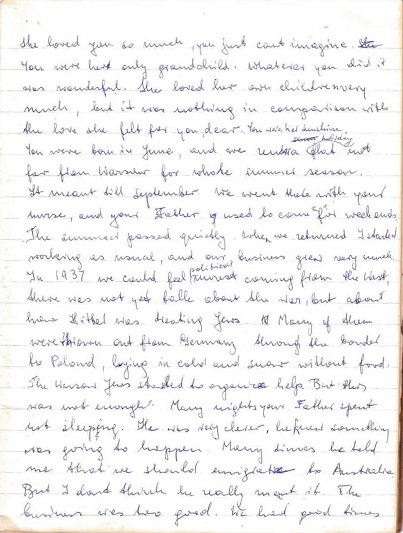 And, below: a scanning of a page from the third notebook of her memoirs that begins with the words she wrote that I quoted earlier, and two photos I have of chubby little me in clothes my grandmother probably made for me. she sounds like a wonderful person. I wish we could have known her. beautiful writing!! love seeing this comment from you here. & i appreciate your appreciation!